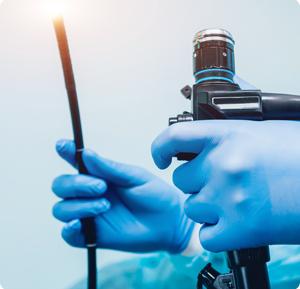 An esophagogastroduodenoscopy (EGD), better known as upper endoscopy, allows a physician to look inside your upper GI tract: esophagus, stomach, and duodenum (the first section of the small intestine). It can help the doctor evaluate symptoms such as difficulty swallowing, nausea, vomiting, reflux, indigestion, abdominal pain, bleeding, or chest pain and diagnose your condition. You will be sedated for the procedure. The doctor then inserts a thin, flexible, lighted tube (endoscope) down your throat. The endoscope provides images of the inside of your esophagus, stomach, and small intestine, so that your physician can examine the lining of these organs. The endoscope also blows air into the stomach, which makes it easier for the doctor to examine your stomach. An EGD enables your doctor to see any abnormalities, such as inflammation or bleeding, that don’t show up as well on X-rays. She can also insert instruments into the scope to treat any bleeding or to obtain tissue samples for a biopsy. An endoscopy usually only takes 20 to 30 minutes to perform, but you should expect to be at our facility for up to 2 hours. Since you are being sedated, you should bring someone to take you home as you will not be permitted to leave without a driver. To learn more about EGD and other procedures performed at North Shore Gastroenterology in Westlake and Brooklyn, Ohio, schedule a consultation by calling us at (440) 808-1212 or complete our convenient online appointment request form.